Interested in learning how to put your technology, engineering, business or liberal arts degree to work? 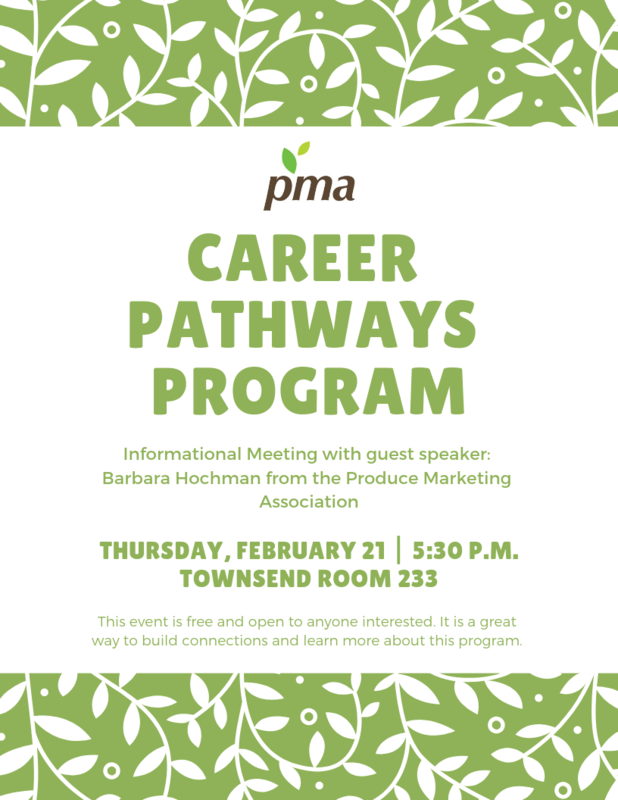 The Center for Growing Talent by PMA is offering a unique program to UD students called “Career Pathways Program” in conjunction with the New England Produce Council (NEPC) Annual Produce and Floral Expo. This year’s Career Pathways program will be held Monday, September 11 – September 13, 2017 in Boston, Massachusetts. A faculty advisor will accompany students on this trip. Selected students will be interviewed immediately upon applying. This is an all-expense paid opportunity (housing, meals and transportation) for you to learn about a myriad of career opportunities within the produce & floral industry. It an awesome opportunity to network with over 200 employers, attend professional development workshops, etc. Attendees will be assigned a senior level manager to serve as your mentor during the Expo. This is not a permanent job…it is an experiential learning opportunity for you to learn about the myriad of career opportunities in the produce industry. There is no GPA requirement necessary to participate in this event. Attending the New England Produce Council’s Produce and Floral Expo through the Produce Marketing Association Foundation in Cape Cod, Massachusetts was an incredibly valuable experience! I learned more about the produce industry–its culture, employment opportunities, challenges, etc. — networked with experienced and passionate professionals (ranging from producers to distributors to brokers), met and connected with students from other universities, and toured a local organic farm. Each day, the PMA Foundation scheduled lectures, workshops, and networking opportunities surrounding education about the produce industry. They also paired us each with a mentor to walk the expo floor with on the last day. I am honored to be able to share the connections I have made with other UD students and aid them in finding a job in the produce industry- whether they study agriculture, business, or even psychology! Click on the link below to learn what UD students had to say about the Pathway program. Deadline to apply: Friday, May 12th.